When I started the 52 Ancestors in 52 Weeks challenge, I decided to focus on direct ancestors, with the occasional foray into collateral lines. This is one of those weeks. While I have no shortage of strong women (this week’s theme) to write about from my direct lines, there’s a group of woman I came upon in my research for whom I have particular admiration. Agnes Florence Prowse was born on August 5, 1872 in Charlottetown, Prince Edward Island. She was the youngest of the 12 children of Joseph Jarvis Prowse (the brother of my 2g grandfather, Samuel Prowse, 52 Ancestors #4) and Agnes Rider Jarvis (the niece of my 3g grandmother, Agnes Rider). Agnes had an older sister, Elizabeth Prowse, who was born in 1864. Following the death of her sister-in-law in 1889, Elizabeth moved to Murray Harbour, PEI, to care for her brother Isaac’s two young children. In 1894, Elizabeth, like many unmarried women of her generation, made her way to Boston to seek employment. In 1896, Agnes, age 23 and unmarried, gave birth to a daughter who she named Bessie. In 1897, Agnes left Bessie in the care of her brother Phillip and joined her sister Elizabeth in Boston. In 1900, Agnes and Elizabeth were working as servants in the same household in Boston. By 1906, Agnes had reunited with her daughter back in Charlottetown. In 1911, Agnes and Elizabeth were running a small boarding house, in a home that they rented. Bessie, then aged 15, lived with her mother and aunt. By 1921, they owned a larger house on Euston Street in Charlottetown, which they also ran as a boarding house. By this time, Bessie had begun her long career as a teacher and was living with her mother, aunt and 5 boarders, all male. It can’t have been easy raising a child as a single mother in the early 1900s in Charlottetown. She clearly raised a strong, independent daughter. Bessie became a teacher who was much loved by her students and was an active member of the PEI Professional and Business Women’s Club, including acting as President of the club for several years in the 1960s. Bessie never married and had no children that I know of. Unlike many in her immediate and extended family, who had long detailed obituaries, Agnes’s death warranted barely a mention in the local paper. To Agnes, Elizabeth and Bessie – you may not have left descendants, but know that you are not forgotten. 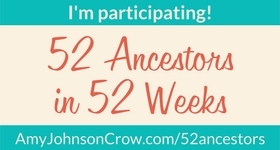 We’re up to week 9 in the 52 Ancestors challenge. Over the past 8 weeks, as I have seen each prompt, I’ve thought of different ancestors I could choose, before finally settling on one. But this week was different. When I saw the prompt “Where There’s a Will”, I knew immediately who to write about – my 4th great grandfather, Richard Rider. Not only did his will give me valuable information about his children (including an explanation for something I had been curious about), it also gave me an impression of who he was as a person. And all this in about 100 words! Richard Rider was baptized on July 18, 1766, in North Huish, Devon, England. He was the son of William Rider and Joan (Unknown). Richard married Agnes Pilditch on June 19, 1790 in South Milton, Devon. They had 8 children who were baptized in the All Saints Church, South Milton, 5 of whom survived to adulthood. The 2nd oldest of these children was my 3rd great grandmother, Agnes Rider, who married William Prowse in 1822 in East Stonehouse, Devon, and had seven children, including my 2nd great grandfather, Samuel Prowse (52 Ancestors #4). In or before 1824, Richard & Agnes Rider and at least three of their children left Devon, England to settle on Prince Edward Island. Richard and his eldest son, John, purchased lots 416 and 417 in the Royalty of Charlotte Town. They later petitioned to receive to adjacent lots of crown land, lots 415 and 437, which was granted on August 3, 1824. William and Agnes (Rider) Prowse also settled in Charlottetown, though it is unclear whether they came at the same time as Agnes’s parents, or whether they followed later. One of their children, born in Devon before they emigrated, was Joseph Jarvis Prowse. When I was researching Joseph, I came upon the baptism of one of his sons, which listed the mother’s name as Agnes Rider Prowse. Was this a mistake? Were Joseph’s wife and mother both named Agnes Rider? Further research would reveal that Rider was her middle name – her full name was Agnes Rider Jarvis! So Joseph Jarvis Prowse, son of Agnes Rider, married Agnes Rider Jarvis. They must be related – it would be much too coincidental for them not to be. It was Richard Rider’s will that would lead me to the answer. To Joseph Prouse, one pound. To Richard Jarvis (son of William and Peggy Jarvis in England), one pound. To Elizabeth Grace Rider (daughter of Jane Bryenton), my bed and bedding. My son John may purchase lot 437 at a fair value decided by three or five other men. The proceeds are to be equally divided between my five children. I appoint my children John, Agnes Prouse, Peggy Jarvis of England, Grace Wise, and Jane Bryenton as Executors. All of my children are to have an equal share in my effects, after giving Jonathan Pillage Rider and Robert Herwood my watch to be valued and divided between them. Dated 1 Sept. 1837. How very helpful to have his daughters’ married names listed! Based on this information, I was able to track down each of them. And look – one of them married a Jarvis! They had a daughter named Agnes, who later married her cousin, Joseph Jarvis Prowse. This still doesn’t explain Joseph’s middle name of Jarvis. Could he have been named after his mother’s brother-in-law? It’s possible, but I believe instead that William Prowse’s mother was also a Jarvis, though I haven’t yet determined whether or how she was related to William Jarvis. More on this when I profile William Prowse in a later post. To Joseph Prouse, 1 pound. Joseph was the oldest of Richard’s grandchildren. At 13 years old at the time Richard’s will was written, one can imagine that Joseph was a help to his grandfather. To Richard Jarvis (son of William and Peggy Jarvis in England), one pound. Richard Rider Jarvis was 9 at the time. It is unclear from the wording whether he was with his parents in England, or whether he was on Prince Edward Island with his grandfather. I suspect the latter, as he was not listed with his family on the 1841 census of England. His mother and sisters emigrated about 1845. To Elizabeth Grace Rider (daughter of Jane Bryenton), my bed and bedding. Elizabeth was born on April 6, 1832 and was baptized 18 months later on October 30, 1833. Elizabeth’s mother, Jane Rider, married George Bryenton in 1835. “Prince Edward Island Church Records, 1777-1985,” images, FamilySearch, Queens > Charlottetown > Anglican Church of Canada St Paul > Births, baptisms 1777-1939 > image 231 of 559; parishes, Prince Edward Island. I can’t help but have kind thoughts about a 72-year-old man in 1838 leaving something as personal and practical as his bed and bedding to his 5-year-old granddaughter who was born out of wedlock. To me, it speaks of protection and safety – no matter what happens, she would always have a bed to sleep in. The only other specific article mentioned in Richard’s will was his watch, which was given to Jonathan Pillage Rider and Robert Herwood “to be valued and divided between them”. I find that very curious – why not just give the watch to one person? The only way to divide it between the two is to sell it and share the proceeds. Usually a watch is something to be passed down, not to be sold. So while Richard’s will gave me some answers, it also left me with a question. And I’m okay with that. It’s the questions that keep me exploring my family history.